Los Angeles’s downtown was little more than a sleepy office district not too long ago, where tens of thousands of suburbanites would clear out by the end of the workday and scores of classic Beaux-Arts and Art Deco buildings sat vacant or underutilized. Today, cranes dot the skyline and construction routinely diverts traffic as Downtown Los Angeles — a neighborhood known as DTLA — undergoes the biggest development boom since the Roaring Twenties, when the area was then the center of the entertainment industry. As the city prepares for the 2028 Summer Olympics, a spate of new apartments, hotel rooms and retail and office space is steadily coming online throughout the 5.84-square-mile downtown area. Existing structures are being recycled, and the city’s public transit system is being expanded and improved. But as development grows, city officials are facing criticism over a lack of affordable housing. The business improvement district was formed in the late 1990s just as a resurgent interest in urban life was taking shape across the country. 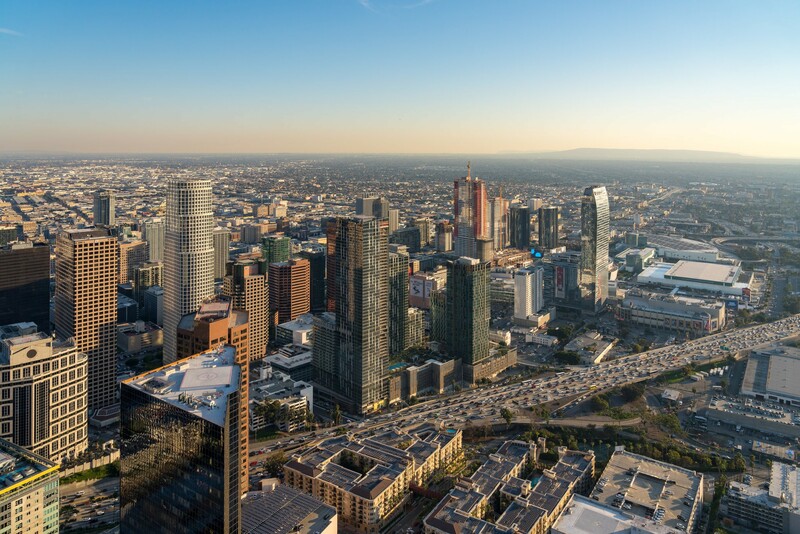 Looking to meet a growing demand for housing and commercial expansion, local planners and businesses set out to revive the district and its celebrated past, maintaining that a strong core would benefit all of Los Angeles as well as the entire region. Downtown construction projects will add more than 7,000 residential units, according to the business improvement district’s year-end market report, and more than 35,000 are in the pipeline. Nearly three million square feet of office space is under construction, the report said, and an additional 3.3 million square feet has been proposed. The redevelopment extends to civic and cultural projects, including the Metro Regional Connector, a 1.9-mile light rail extension through the heart of downtown, and the replacement of the arched Sixth Street Viaduct. The Los Angeles Convention Center is getting an overhaul, too. Older buildings are also being repurposed at a rapid clip, enticingmany businesses and institutions to plant roots downtown. The Warner Music Group is relocating to the old Ford Factory, and Arizona State University is leasing 80,000 square feet in the Herald Examiner Building, built in 1914 and designed by Julia Morgan, the architect of Hearst Castle. And technology companies like Spotify and the online coupon company Honey have opened office space. Older buildings in Downtown Los Angeles are being put to new uses, like the Herald Examiner Building, where Arizona State University is leasing space. The start of the renaissance, most local observers say, can be traced to the opening of the Staples Center in 1999. That year, the city passed the Adaptive Reuse Ordinance, making it easier for developers to convert old buildings into multifamily or creative spaces, including a notable number of Beaux-Arts towers. Mapping out the city’s long-term vision is a set of extensive rezoning plans, which project 125,000 residents, 70,000 housing units and 55,000 jobs downtown by 2040. “Our goal is to really bring people and density to the downtown area as it was originally envisioned and intended,” said Shana M.M. Bonstin, the deputy director for the community planning bureau at the Los Angeles City Planning Department. But housing advocacy groups claim that the revitalization plan does not fully address a shortage of affordable housing. A report released last spring by the California Housing Partnership and the Southern California Association of Nonprofit Housing said that to satisfy the demand of lower-income renters in Los Angeles County, 568,255 new units were needed. Aware of the rising rents, Ms. Bonstin said affordable housing was a priority for the city. “Many projects have a component of affordable housing,” she said, noting that the Weingart Center for the Homeless was putting up two towers that would classify all units as affordable. Mr. Griffin believes that the growth projections will easily be surpassed, and that downtown could become a city within a city, with as many 200,000 residents in the next 21 years. Already, he said, there are an estimated 70,000, up from 18,000 20 years ago. Brookfield has a few developments in the works, including a residential tower next to its Figat7th shopping center, as well as a $170 million overhaul and modernization of the California Market Center in the downtown’s fashion district. A significant portion of the new DTLA development has been driven by foreign investment. Duncan Wlodarczak, the chief of staff for the Onni Group of Vancouver, British Columbia, said his company saw untapped value in the downtown when it began looking for potential investments about a decade ago. Onni has since become one of the most active developers downtown, with projects ranging from the Studio House, a residential development with micro units, to the renovation of Times Mirror Square, the downtown campus that housed The Los Angeles Times. Other foreign-owned developments in the works include massive mixed-use developments. Work continues at the Metropolis by the Greenland Group of Shanghai, a complex in the South Park neighborhood with three residential towers with 1,600 condominium units, a 350-room hotel and 70,000 square feet of retail space. Tower 1, which opened in 2017, is nearly sold out, according to Donald Stanek, the sales and marketing director for the Los Angeles office of Greenland USA. Sales have been going well for Tower 2 since they began in June, he said, and the third tower should be completed in 2020, with sales opening later this year. Foreigners dominated the buying pool initially, Mr. Stanek added, but lately there have been more regional purchasers looking for housing closer to work that fit their budgets. The average monthly rent for an apartment in Los Angeles was $2,371 in February, a 7 percent rise from a year earlier, according to RentCafe. A version of this article appears in print on March 5, 2019, on Page B7 of the New York edition with the headline: A Sleepy Giant, Los Angeles’s Core, Reawakens.